Like in neighbouring countries, Yemen’s government has only made limited strides in fighting corruption. In the Middle East and North Africa, tear gas, bullets, office raids and imprisonment have been the hallmarks of state and non-state actions against civil society activists fighting corruption. The Bahraini government proposes a draconian NGO law; while Egyptian, Jordanian and other countries’ NGO laws continue to restrict NGO registration, freedom to operate, and international funding and cooperation. The Algerian government prevented Algerian corruption fighters from leaving the country to attend an international gathering in neighbouring Tunisia. In Yemen, unknown assailants shot and injured an anti-corruption activist, just this past week Lebanese officials are alleged to have assaulted journalists investigating corruption in their department. The promises of a region in which governments value diversity of opinion and include civil society in their governance largely ring hollow. When governments shut out the public, it comes as no surprise that opportunities for meaningful scrutiny and accountability diminish, and corruption risks in the public sector increase. The latest Corruption Perceptions Index (CPI) underpins this trend: conflict-wracked countries like Syria and Yemen significantly declined to the world’s bottom ranks for perceived levels of corruption. In addition, countries believed to be on a trajectory toward greater transparency have largely stalled and only a few countries marginally managed to improve their standing. On a 100-point scale measuring corruption in the public sector, 84% of Middle East and North African countries score below 50. The average regional score is 37, significantly below the global average of 43. One of the positive trends in the region has been the drafting of general laws guaranteeing access to information. If properly implemented, citizens and organisations could monitor governments better and play an important role in preventing corruption. Despite this positive trend, implementation has been slow coming. In Tunisia, ranked 77 out of a total of 177 countries the CPI includes globally, civil society organisations have agitated for changes to the access to information law. These have been recently been taken on board by the government. One improvement has been the setting up of an independent commission to monitor government performance on granting access to information to the public. The same commission is responsible for processing appeals if specific requests are denied. In Yemen, the current government has made limited progress on fighting corruption. It failed to issue implementing regulations and only recently appointed a commissioner to head the information council for handling information requests under a progressive access to information law passed in 2012. The prosecution did not always work smoothly with the cases the national anti-corruption commission presented to it, and this year local civil society groups sued over alleged irregularities in the appointment of members of a new board to the commission. 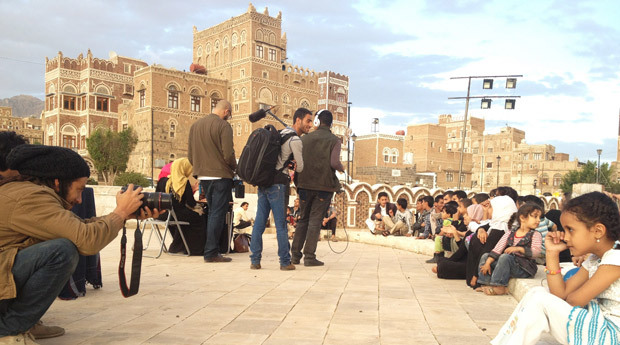 With an increasingly fragile and heavily securitised political landscape, Yemen has descended five points and civil society is not wholly protected in its advocacy efforts. The perception of corruption is now comparable to that of other conflict-ridden countries such as Iraq, Syria and Libya where violence and political instability has scuttled the initial goodwill to combat corruption, ranging from goods to guns to people being trafficked and hands exchanging bribes. We identified evidence of bribe-paying in the police force that has unfortunately become a daily occurrence for Yemeni citizens. Egyptian civil society is enduring one of the most difficult periods since the 25 January 2011 revolution that deposed Hosni Mubarak. The popular outpouring on the streets calling for bread, dignity and social justice, which led to elected President Mohammad Morsi’s demise in June 2013, reflected mass disappointment. Egyptians were disappointed that no decisive steps against decades of cronyism had been taken or shown effect. 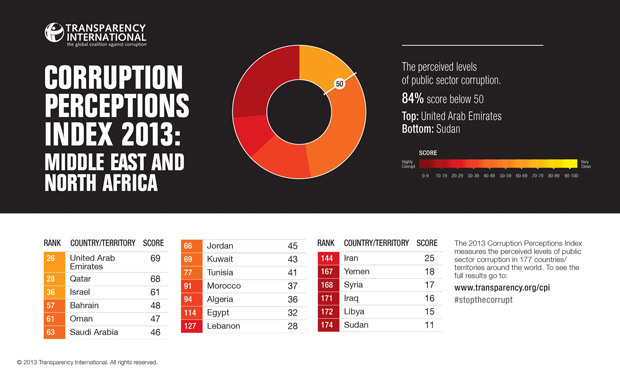 Egypt’s corruption perceptions score has not changed from last year – an indication of the lack of concerted political will to harness the people’s desire to stamp out corruption. Strengthening freedom of expression, assembly and association, as well as access to information is the right path to follow for improved transparency and accountability. Transitional and reforming governments should recognise the importance of a strong and free civil society as a partner in anti-corruption efforts, and allow them the space for critical dissent.